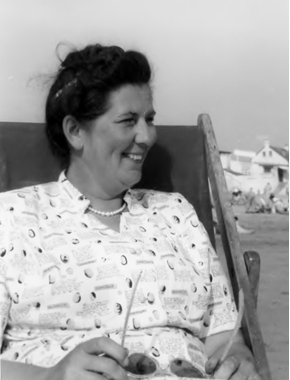 In 1954/5 the Carpenter’s daughter Connie Robertson moved with her family from London into the accommodation above the shop in Stanstead Abbotts. The Carpenters thus displaced moved to Queens Road in Hertford. From that time Mrs Robertson ran the shop and her husband commuted by train to London where he retained his job with the Electricity Board. It is not certain but it is likely that when she was running the shop her father still owned the premises. Constance Adelaide Robertson shopkeeper in white to the right with just one foot on lower step. Older lady on left as yet unknown. [Possibly one of the Miss Akers from next door [no. 56]. 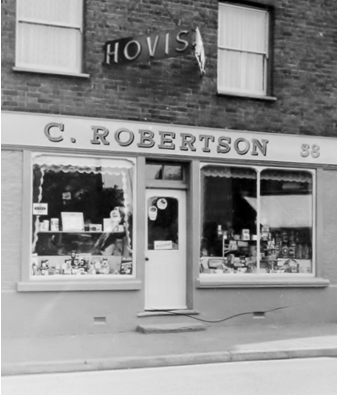 The shop traded as ‘C Robertson’ and soon had its shop front and signage repainted. 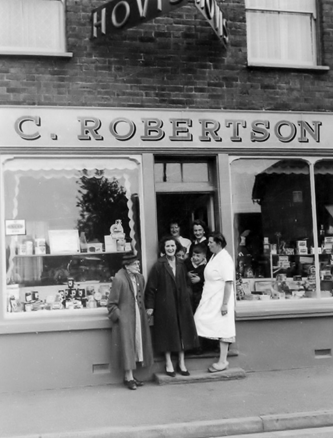 Mrs Robertson continued to run the shop until she became seriously ill forcing her to give up running the shop in 1959. 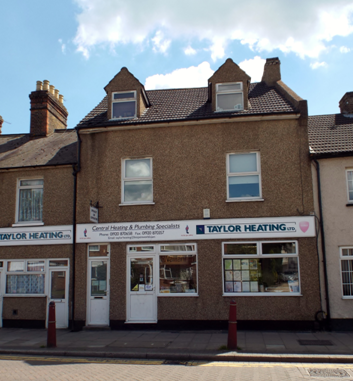 The family then sold the premises and business to the Kenniwell family and the Robertsons moved in with William and his wife in Queens Road Hertford, where they had moved some five years previously when Connie had taken over the shop.